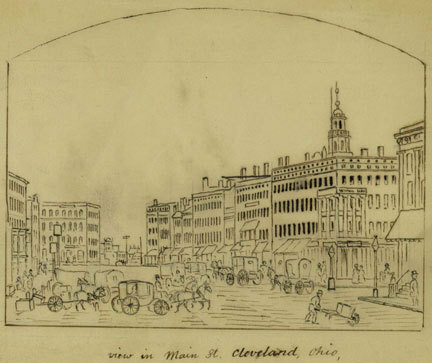 Cleaveland oversaw the plan for the modern downtown area, centered on the Public Square, before returning home, never again to visit Ohio. The first settler in Cleaveland was Lorenzo Carter, who built a cabin on the banks of the Cuyahoga River. The Village of Cleaveland was incorporated on December 23, 1814. In spite of the nearby swampy lowlands and harsh winters, its waterfront location proved to be an advantage. The area began rapid growth after the 1832 completion of the Ohio and Erie Canal. This key link between the Ohio River and the Great Lakes connected the city to the Atlantic Ocean via the Erie Canal and later via the St. Lawrence Seaway; and the Gulf of Mexico via the Mississippi River. Growth continued with added railroad links. Cleveland incorporated as a city in 1836.